It's a nails-heavy week here at The Beauty of Life! Every brand seems to be announcing its newest collections this week, and I have another beautiful one for you today -- Zoya Intimate. The Spring 2011 collection is inspired by the feeling of intimacy -- temptations, whispers, dreams, secrets, illusions, liaisons, trysts ... even kisses and lingerie. Each nail polish will retail for $7. 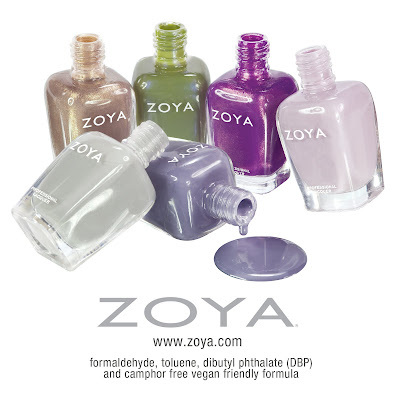 The collection will be available on January 15 at zoya.com. Zoya makes wonderful nail polish. And I just love their colours! Such a lovely post with very pretty colures! It’s fantastic. What a lovely collection is here. I really like it. I have long and sharp nails. I always want to use this type of nail paint. The colures are amazing. This is very light. That’s what I call natural. It’s smell like perfume. Thanks for sharing.